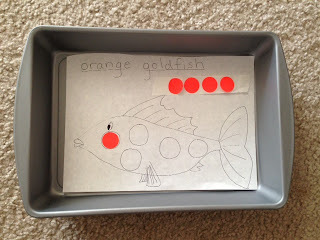 Orange Goldfish Week was very fun as it is a favorite color around here! Being the last week of our BBBBWDYS book, we wanted to make it a good one! Mr. Little Man was finally on the mend after being sick so by day 2 or 3 of this week, he was back to his charming, happy little self. Tot School (& life) is way more fun when we are both feeling well! 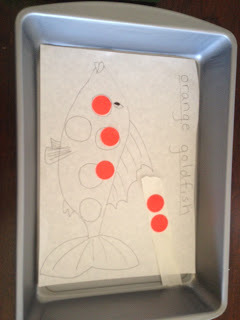 In prep for the week, I set up our fish & or orange books. As with each other week, I left his BBBBWDYS book open to the Orange Gold Fish page as well as some stacking blocks. 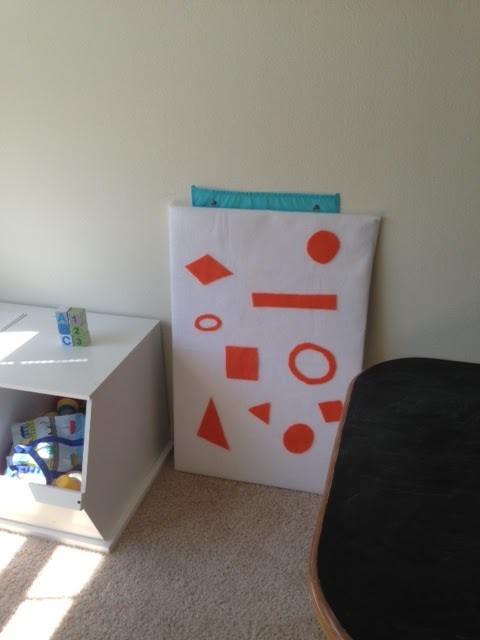 We had a felt board out for the week with various orange shapes. 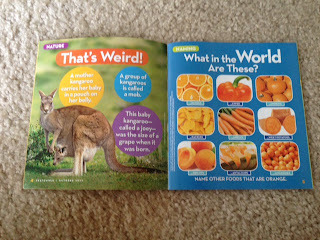 Lastly, I had his National Geographic Little Kids magazine that had a feature with orange foods. He loved pointing and naming these with mommy and daddy this week... "What is dat!?"... adorable little guy. 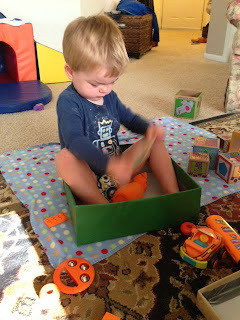 The set up stuff is things that I leave up all week, things he can do on his own quietly with or without me. 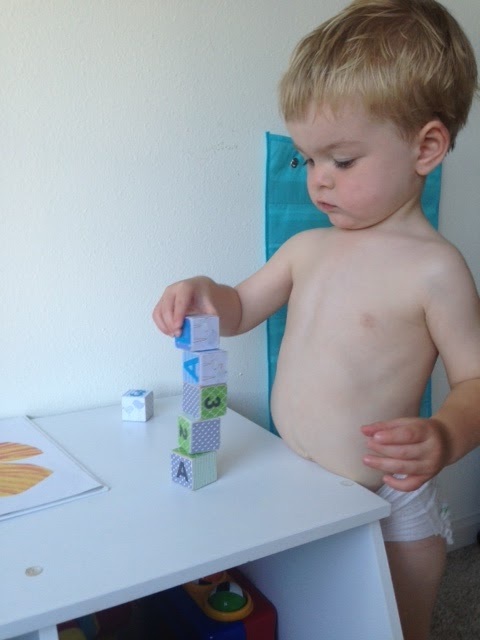 He loved his blocks this week... lots of stacking, 'counting' & knocking them over like Little Man-Zilla. Throughout this week our lessons and trays were tons of fun! Most were a hit but not all of them. 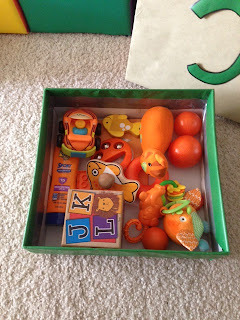 We did another sensory box that was full of various orange colored items. As it had last week, he really didn't have much interest in this. He did spend 3-5 minutes pulling everything out, climbed into the box, refilled it all on his lap, cleared it again and then left. 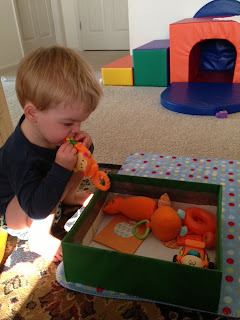 This was much more interest that last weeks sensory box. 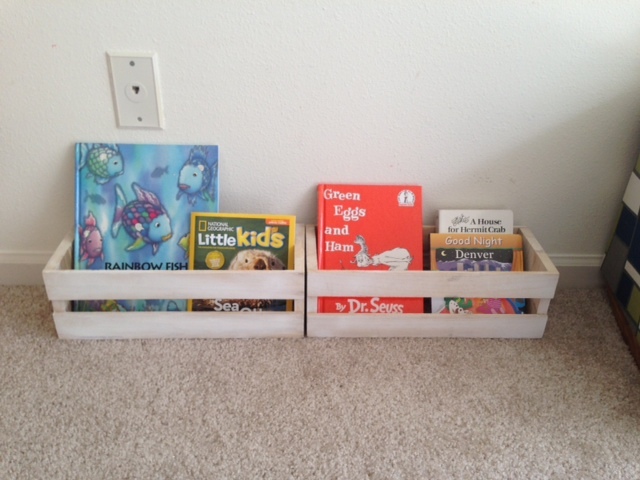 I think we will come back to this type of box in a few weeks as the rice/pasta/bean trays are a favorite. 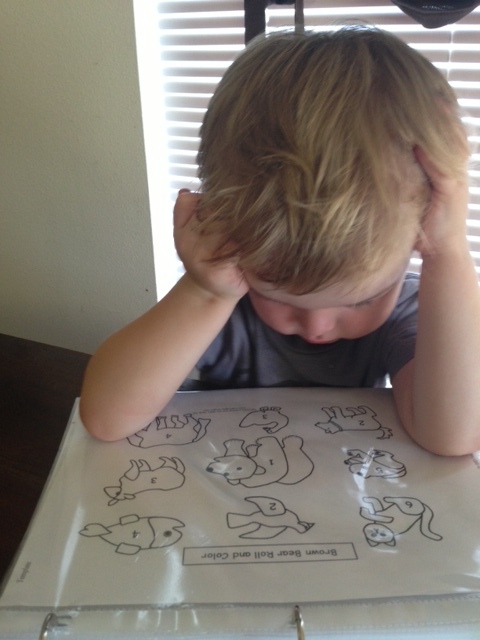 We did some coloring with our same BBBBWDYS printouts since they are in plastic sleeves. 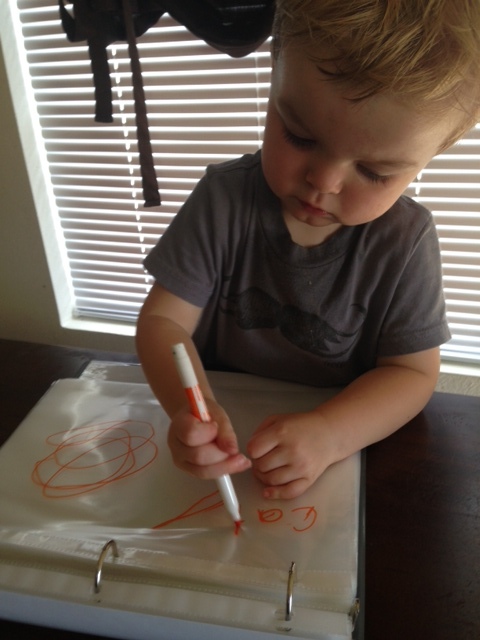 He was very studious this week with writing and coloring. His concentration in this next picture is just unbelievable. 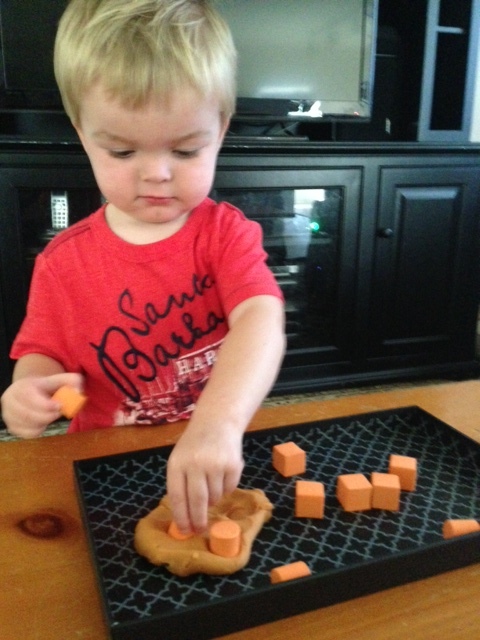 Another day we played with orange play dough and some orange foam blocks. These were fun to squish the play dough and roll etc. He enjoyed the combo. A favorite tray of the week was this sticker & fish picture. I drew a sketch of a fish and put some circles on this fish's back. 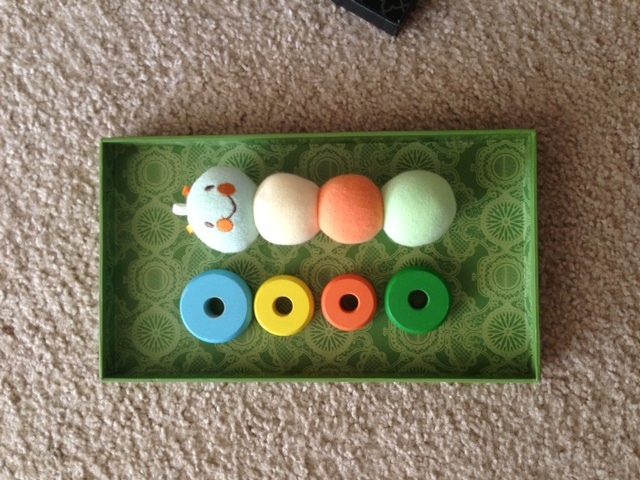 The idea was he would put the orange circle stickers in the drawn circles. I did the first one for him and then he jumped right in. Here is a picture half way through the activity. My camera died after this so I didn't get a final picture or an action photo. We went on two field trips surrounding our theme this week! 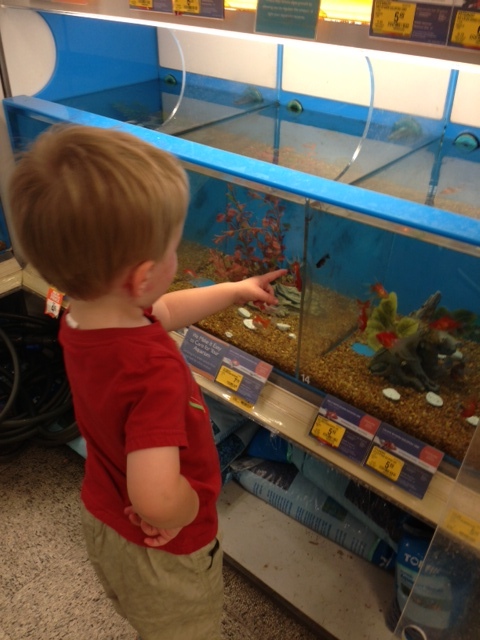 First we went to Pet Smart to see some real gold fish... he loved this! Me must have spent 30 minutes looking at the fish, birds and turtles. He went crazy when he say an orange goldfish... I was so happy ot see him make the connection that that was our special theme! He loved the fish but was thrilled ot see a real orange fish swimming around. We also went out for ice cream for the last time of the summer as fall seems to be creeping in. Mr. Little Man got an orange sorbet and loved it... while he recognized it was orange with a smile, he really just loved getting to eat his yummy treat! We watched and sang a new song that neither of us had heard before this week by The Laurie Berkner Band called The Goldfish. He enjoyed watching this music video and listening to the cute song. 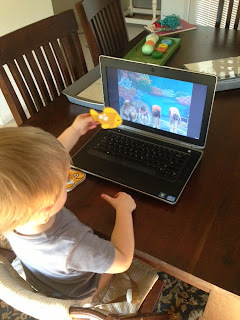 We used his goldfish puzzle pieces while listening so we could 'swim' along. We also sang Baby Beluga all week... he is obsessed, especially when I sang the song alongside the book. Learned to spread peanut butter on his crackers... he loved getting to use a (butter)knife like a big boy. 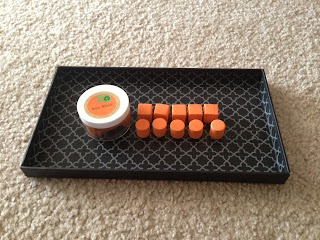 We also practiced peeling an orange and breaking off the pieces to eat. 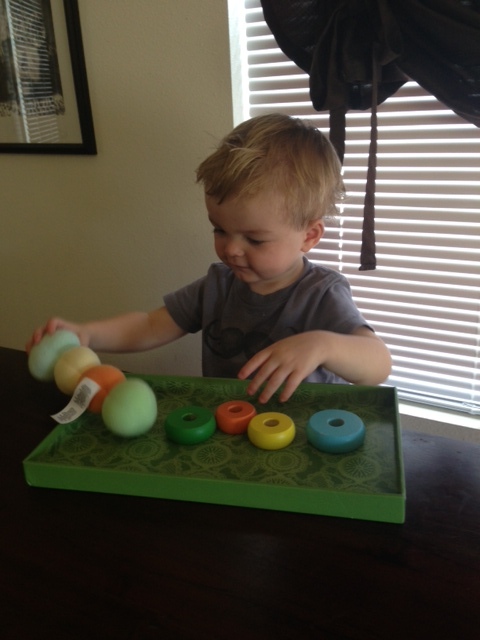 He loved this so much, we must have practiced at least 4 times this week. Mr. Little Man did not want to read Brown Bear, Brown Bear, What Do You See? I was a little sad but also a little thankful... we must have read that 1000 times since we started this BBBBWDYS tot school color adventure. I think now that we have completed all of our colors from the book I will put the book away for a while and hope it is greeted with the old excitement once the "Mom, I'm so over this book" wares off for Mr. Little Man. 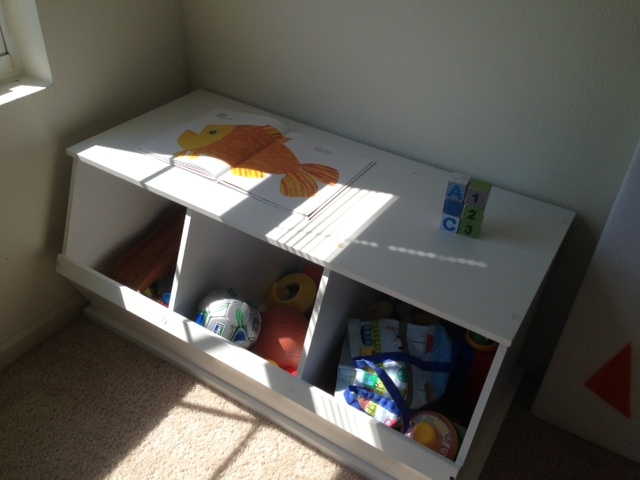 Check out the Tot School Gathering Place! & The Crafts & Early Learning Link Up! Subscribe To Mr. Little Man! I'm a mom to Mr. Little Man, a sweet and adventurous toddler and wifey to an amazing husband. We are a busy family and loving every minute of our crazy life. I nannied for 13 years before becoming a mom myself. I love children and watching them grow into their own little selves. I am so blessed to be this little boys mom. Cheers to our slightly crazy, totally busy, amazing new life as a family.